Last Sunday , after Michelle and I went with my younger brother to climb up the stairs going up to Crescent Road (for exercise), we walked to Tailblazers in Inglewood to buy dog food for Lorenzo & Cachita. It was a nice hot day so it was a very pleasant walk. After we came out of the river and continued our walk back home, I decided to take of advantage of Michelle’s unusual willingness to be "adventurous" and suggested we cross the river by the zoo to take a shortcut home. There’s a big suspension bridge that gets you onto St. Patrick Island from Fort Calgary and the river is narrow and very shallow on the other side – it’s right beside the bike paths next to Memorial Drive. Here’s a map of the area (you can see the suspension bridge). So while the river was indeed narrow and very shallow (the water only came up to our knees), I didn’t count on the current being that strong. It was so strong in fact that we had to carry Lorenzo & Cachita across. Halfway across the river, Michelle got tired and scared and wanted to turn back, but we were already half-way. I suppose it would have been easier if we didn’t have to carry the dogs across, and if we didn’t have our backpacks full of frozen dog food bags – or maybe that wouldn’t have mattered anyways… The current was super strong. All it took was less than ½ a second for Michelle to lose her balance and pull me down with her. Cachita was the first to float downstream and Lorenzo quickly followed while Michelle tumbled down the river (literally), and while I tried to crawl my way across… (I love adventure, so for me it was fun!) Once I crossed the river, I ran downstream to catch up to Cachita and to try to get her to swim across to the edge. She made it seem easy and she wasn’t scared at all – in fact, she was having fun! But Michelle freaked out of course, thinking They’d both float away and that we’d never see them again, so she was yelling for them as if they had just died or something… When she yelled for Lorenzo to swim across, the overwhelming fear in her voice scared him into swimming back to the other side instead… LOL! I eventually had to go to the other side (via the St. George bridge at the zoo) to get Lorenzo while Michelle waited by the river to keep Lorenzo at the river bank… We both got thoroughly wet, but luckily our iPhones (which were in our backpacks) both survived being submersed. :-) Lorenzo & Cachita were both fine too – Lorenzo was a bit scared, but once I met up with him he was OK. The only damage we incurred was to our bodies. So while we’re both still in pain from the day’s "activities", I don’t regret it at all – it was fun. Michelle on the other hand, she’s not so sure I know what "fun" is supposed to mean… Yes, the bruises hurt (I have bruises on my knees, my feet, my toes, my knuckles, etc.) and it hurts to walk, or even stand, but I find myself dwelling more on how fun it was than on the pain. 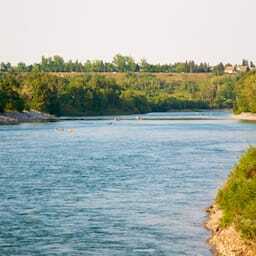 Bow River Crossing was published on Thursday, July 24, 2008 at 1:34pm MDT by Daniel Menjívar and last updated on April 11, 2018 at 9:30pm UTC .